Starting in the 1940s, the scientific establishment began voicing concerns over high-fat diets. Early studies showed correlations between high-fat diets and high cholesterol, but despite lack of finding of causation between the two, the seeds were planted for an ill-advised, decades-long push for a low-fat diet. Carbohydrates, not healthy fats, have been behind the alarming rise in obesity and type 2 diabetes. The results were disheartening. Cutting out fats and largely replacing them with carbohydrates became the conventional wisdom right at the start of the American obesity epidemic, and it’s only now, that doctors and scientists are rethinking their attitudes toward the high-fat diet that was typical for much of recorded history up through the middle of the 20th century. Today there is a wealth of scientific data showing that a high-fat diet benefits weight control, heart health, and type 2 diabetes. A number of studies starting in the early 2000s found that people tend to lose more weight when they follow a low-carb diet than when they follow a low-fat diet, and this holds true for people who just want to shed a few pounds as well as those with severe obesity. Furthermore, these studies hold up in adolescents and adult populations of all ages. Reducing carbohydrates is also the key to reducing levels of blood triglycerides and increasing levels of beneficial HDL cholesterol, according to multiple studies. Of course, it’s important to understand that not all fats are created equal. Fats from partially hydrogenated oils are especially dangerous, while fats found in avocados, eggs, fatty fish, nuts, and olive oil are health promoting. Avoiding processed foods can be a tremendously easy way to avoid the worst types of fats, while also cutting back on unnecessary carbs. The right high-fat diet, low in processed foods, helps rid the body of dangerous visceral fat. Belly fat isn’t just a detriment to getting into your favorite clothes: it can also be profoundly dangerous to health. Abdominal fat located around the abdominal organs (“visceral” fat) can, in excess, increase blood pressure while driving up heart disease and diabetes risk. The high-fat diet, known as the keto diet, not only helps adults lose visceral fat, it can do so even while consuming more calories per day! The push for a high-carb, low-fat eating pattern in the 1980s and 90s also coincided with the beginning of the epidemic of type 2 diabetes in America. One study found that type 2 diabetics following the high-fat keto diet lost more weight and had lower A1c values than the participants assigned to a low-fat diet. Moreover, other health markers like blood pressure and triglycerides improved more in the participants who followed the high-fat, low-carb diet. Thirty years ago, the concept of a “high-fat diet” for improved health would have seemed radical, if not irresponsible. But the epidemic levels of obesity and type 2 diabetes, along with more recent and thorough research have shown that it was actually the high-carb, low-fat diet that was bad for people. A high-fat diet doesn’t mean loading up on cake and processed foods, however. 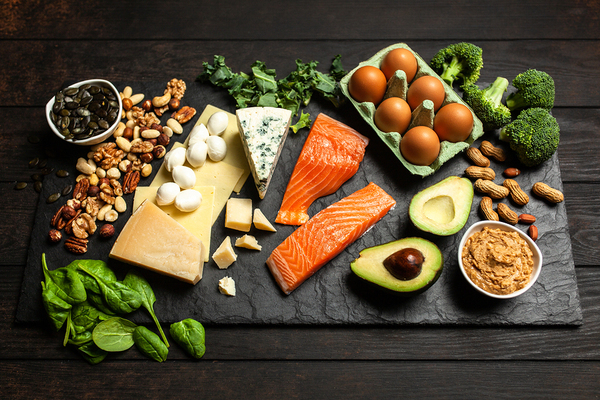 We now know which fats are healthy, and how to include them in a dietary approach that promotes weight loss, better glycemic control, and better heart health. If you would like to know more about how you can benefit from a healthy high-fat diet, we invite you to contact us at any time.